Wildlife greets you on your entrance to Cuffie River, with bands of parrots flying overhead as they make their way to and fro, or hummingbirds of many species whizzing past, mere centimetres from your face. 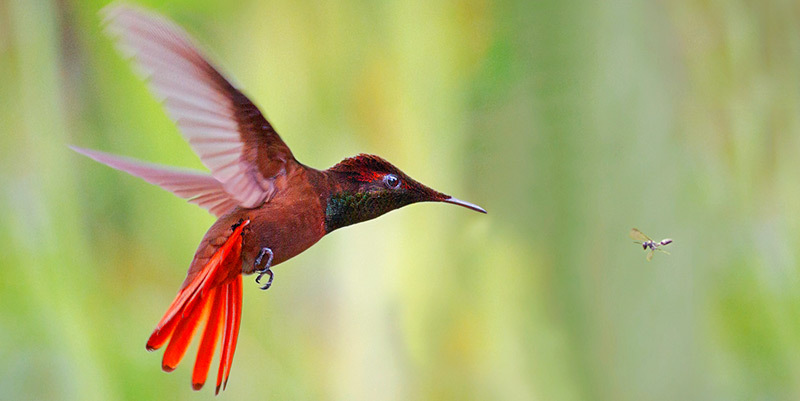 The Cuffie River Nature Retreat and eco-lodge offers the finest in bird watching and nature tours. Walk in the surroundings and encounter some 30 species of tropical birds before breakfast! Truly a birding paradise, you will wonder what kept you from coming before to visit this unique Tobago resort. View at close range the nesting and feeding habits of species, call the birds and be answered in return, observe patterns of socialization between and among species or simply sit back and bask in the sheer beauty of these exotic birds. Follow the nesting patterns from courtship to the laying and hatching of eggs, to observing the parents helping the fledglings leave the nest by teaching them to fly. Our current Census reveals 100 species to be found at the Retreat and its environs. 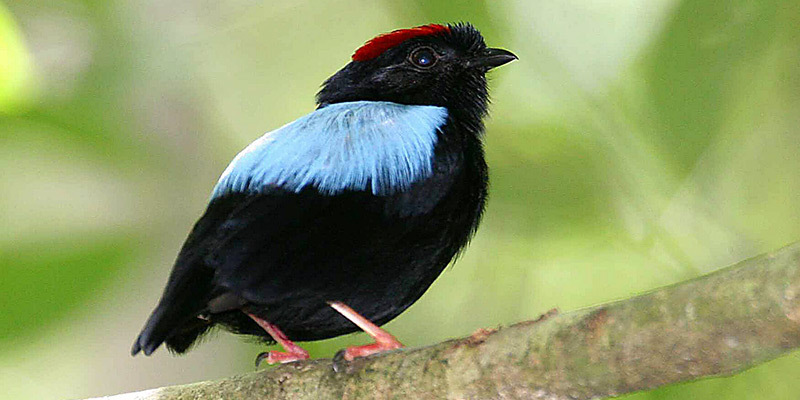 These include all of the most sought-after exotic birds such as the White-tailed Sabrewing hummingbird, Blue-backed Manakin, Ruby-topaz Hummingbird, Collared Trogon, Trinidad Motmot, Yellow-legged Thrush, Common Potoo, Striped Owl, and Gray-throated Leaftosser. Recently we have also found an albino hummingbird (specie not yet defined) on the property. Many feathered friends come visiting at your window and in your room. Others prefer to have you visit them in their personal hideaways as you go on your bird-watching and nature tours. The Common Potoo and the White-tailed Nightjar both keep you company at dinnertime, perched opposite to the guest dining area where they feed on insects from the adjacent yard light. Talk about keeping good company at the resort! Please see our Photo Gallery for a few pictures of birds taken by guests at the Cuffie River Nature Retreat. Complimentary Wi-Fi is provided. Please note that due to our unique location, signal strength and reliability does vary and, subject to your hardware, a Wi-Fi signal may not be available in all rooms. Our swimming pool utilises environmentally-friendly purification, using salt instead of chlorine. The elevated location offers stunning views over the surrounding landscape. A ramp provides access to physically challenged guests. An ideal place to cool off with a freshly mixed rum punch or fruit drink after a walk in the rainforest. Our menus are crafted from local raw materials and cooking expertise and creativity second to none. Breakfast comprise fresh juices, fresh fruit and cereal plus your own menu selection. Dinner menus are "table d’hôte" and reflect the unique, multi-ethnic nature of Trinidad and Tobago. Delicious light lunches are also available.